The weather in Christchurch, New Zealand, has been beautiful all week. The problem is, it's been snowing in McMurdo, which means our plane could not safely land. New Zealand is a nice place to be stranded, but after three days of waiting for the weather to clear, the advance team was ready to go. And here we are! After a loud, bumpy, long flight south in an old-fashioned C130 cargo plane, we arrived last night. Here's what the scene looks like at McMurdo. (The McMurdo webcam is also a pretty good way to check out the weather on station--we kept a close eye on the camera from New Zealand to see when the weather would clear. Right now we need to prepare to get into the field and to make up for those lost days in New Zealand. Our new Antarcticans (Lily and Kelly) are off at Happy Camper school, the nickname we give to Antarctic Survival training. 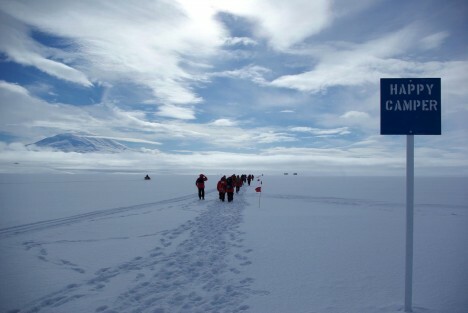 Happy Campers walk down a flag-line trail on the Ross Ice Shelf. Photo courtesy Ludovic Bruker. 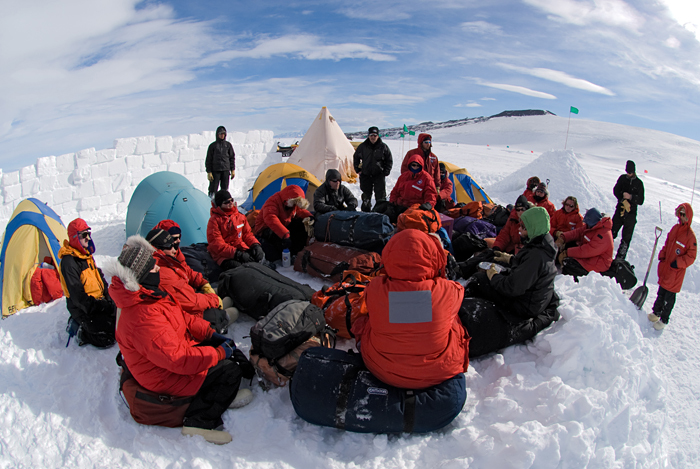 Antarctica can be a dangerous place, so snow school teaches new Antarcticans how to prepare themselves for extreme cold weather. The two-day course is taught mostly outside. Happy Campers take shelter behind a wall made out of snow blocks (quarry your own!) and listen to a field safety instructor. A yellow, pyramid-shaped Scott Tent is in the background, next to a pyramid-shaped snow cave. Cozy. Image courtesy Chris Linder, WHOI. Campers learn how to make the most of their extreme cold weather clothes; how to assemble the various tents they might be living in; how to prepare emergency snow shelters; and how to use the radios that are the main way we communicate with McMurdo station when we're in the field. 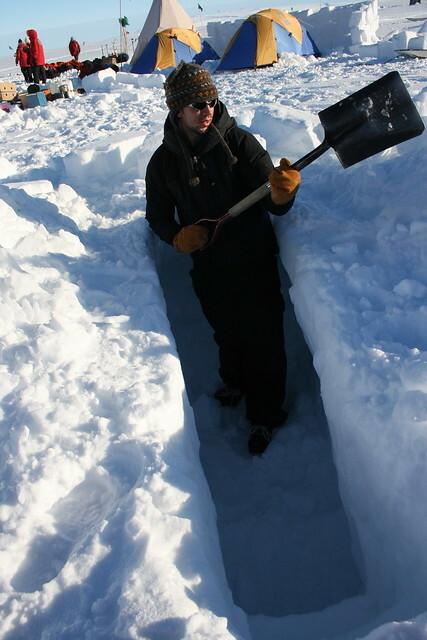 It isn't much, but a snow trench makes for a good spot to sleep out of the wind in the event of emergency. Photo courtesy Eli Duke. Campers also learn how to use emergency stoves to cook survival rations (yummy), and how to diagnose and treat cold injuries like frostbite. Most of the time, people who get frostbite don't even notice it, which is why it's important for our team to keep an eye on each other (particularly, each others' noses, which can freeze in a strong wind). The most memorable moment for many people is during the whiteout drill. When the snow blows in to McMurdo (like it did the last few days, keeping us from flying in), a whiteout can make it impossible to see more than a few inches in front of your face. The bucket-head drill simulates a whiteout. Campers have to search for a friend who's gone missing in the snow. Meanwhile, Jay and I (safely without buckets on our heads) are packing up camp gear and getting logistics ready for our move to the field. More about what you pack for lunch (and breakfast and dinner) in Antarctica in an upcoming post.